Python.PH together with the University of Science and Technology of Southern Philippines (formerly MUST) and PyTsada meetup group, will be holding a Python Conference (PyCon) on February 25 – 26, 2017 from 8:00AM to 6:00PM at the University of Science and Technology of Southern Philippines, Lapasan, Cagayan de Oro City. PyCon PH is a gathering of software engineers, programming enthusiasts, startup founders, corporate IT decision makers, students and IT educators in an engaging two-day event of learning, sharing, and collaboration. For the first time, the conference will be held in Mindanao. Previously, it was held in Ateneo de Manila, De La Salle University, and in UP Campuses. According to the organizers, holding PyCon outside of Manila allowed them to better engage with local Python groups and discover and reach out to a wider pool of local talent. It’s also a great opportunity to explore diverse local attractions. Centered around the theme of “The Python Ecosystem”, the topics for this year’s conference include the use of Python in robotics, smart farms, Philippine micro-satellites, solar power technologies, web applications, and data science. On the first day of the conference, the audience will be given insights into the world of programming, Python and its use cases in these fields. The second day will then consist of hands-on workshops on Test Driven Development, Writing and Consuming APIs and an Introduction to Satellite Data Processing. PyCon PH will feature three keynote speakers from both the Local and International Open Source Communities: Jeff Knupp, Manoj Pandey and Evamay Dela Rosa. 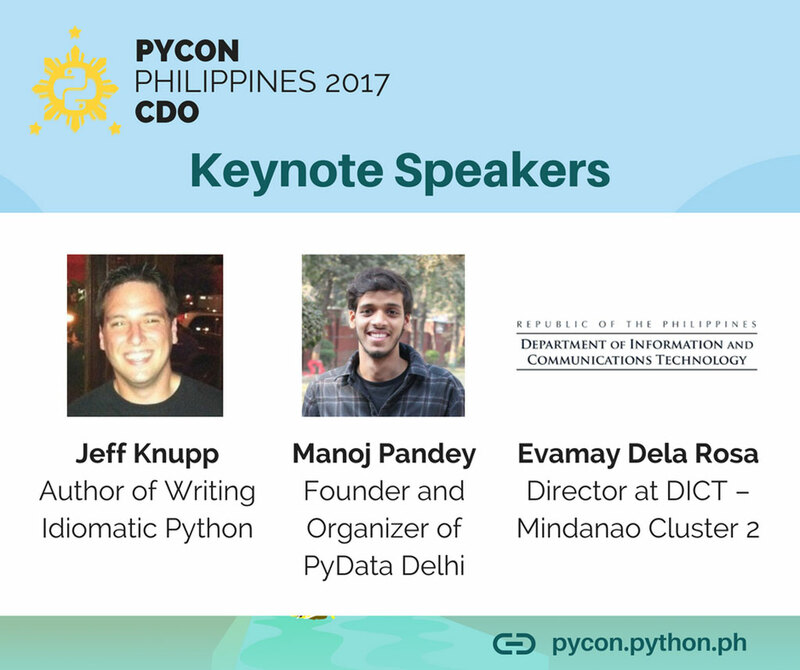 Jeff Knupp is a world-renowned Python programmer, speaker and author, widely known for his book Writing Idiomatic Python; Manoj Pandey is the Founder and Organizer of PyData Delhi; and Evamay Dela Rosa is the Director at Department of Information and Communications Technology – Mindanao Cluster 2. The complete list and more detailed descriptions of the keynotes as well as the other talks are available at the conference’s website here. Additionally, UTSP students will also be presenting their projects involving Python at a student research forum, to a panel consisting of some of the speakers and individuals from Python.PH. 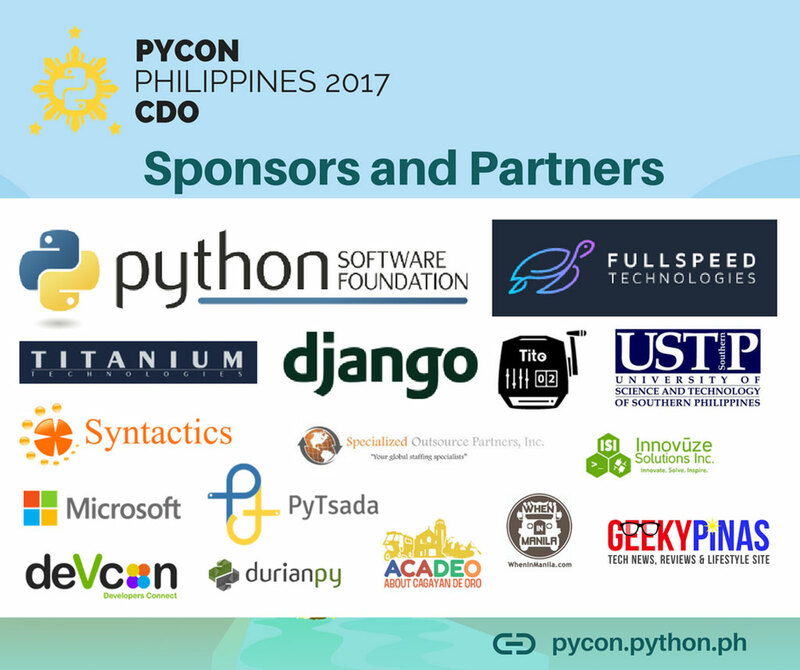 PyCon Philippines 2017 will be a gathering of an estimated 250 enthusiastic Python users and developers from all around the Philippines, making it an exciting opportunity to network and connect with the community. With professionals comprising a significant percentage of the attendees, it would also be a great venue for businesses to scout talent and promote products. This event is supported by The Python Software Foundation, FullSpeed Technologies, Titanium Technologies, The Django Software Foundation, Tito, About Cagayan de Oro, Syntactics, Specialized Outsource Partners, Innovuze Solutions, Microsoft, DevCon Philippines, PyTsada and DurianPy. Get your tickets at https://pycon-tickets.python.ph. You can follow @pyconph on Twitter for the latest updates. If you want to talk about the event, you can use the official hashtag #pyconph.